During this program, learn a set of restorative postures, complemented with gentle stretching, breathing, and meditation. 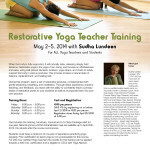 Through direct experience, practice teaching, and feedback, you leave with the ability to confidently teach a primary series of restorative poses to your students as well as incorporate them into your own practice. At the end of the course, you receive a letter of attendance verifying your completion of this 24-hour training. Sudha Carolyn Lundeen, RN, E-RYT 500 has more than 30 years experience in the healing arts. She is a certified holistic-health nurse, an Ayurvedic Health & Lifestyle Coach, Workshop leader, Yoga Instructor/Therapist, Phoenix Rising Yoga Therapist, and senior Kripalu teacher. She leads both 200 and 500 hour level Kripalu Yoga Teacher Trainings and is on the faculty of the Kripalu School of Ayurveda. Sudha’s personal experience with breast cancer combined with 10 years in clinical nursing (Rehab, Recovery Room, and Oncology) lends a sensitivity and broad knowledge base to her teaching style that is described as welcoming, humorous, and healing. Finding Your Way- Expert Help Navigating Breast Cancer is a 2 DVD, 1 CD set. Kripalu Gentle Yoga is DVD that won several awards and contains two 30 sequences. Taming the Winds of VATA is a CD that offers a 35 minute yoga sequence for balancing the nervous system and calming the mind. The training for 2014 has concluded. Please check back for our next dates. $595.00 per person. SAVE $75.00 by registering on or before April 2nd, 2014 for $520.00 per person. Register online, in person or by telephone. Registration closes Friday, April 25th, 2014 at 5:00 pm. Fee includes the training, handouts, manual and a 5-Class Package valid for one year. Refunds (minus a $150 Administration Fee) are available up to April 25th, 2014. No refunds after the course commences. Students must have a minimum of one year of experience practicing yoga regularly. 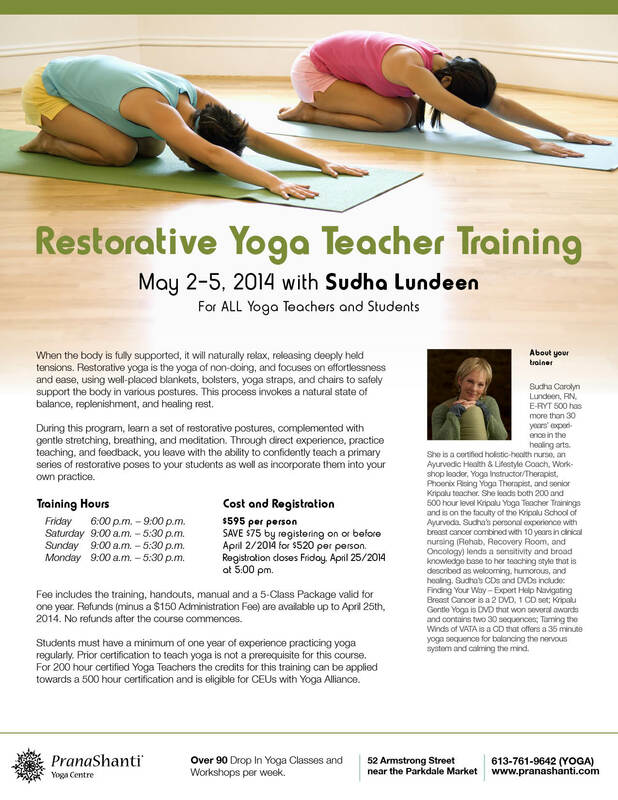 Prior certification to teach yoga is not a prerequisite for this course. For 200 hour certified Yoga Teachers the credits for this training can be applied towards a 500 hour certification and is eligible for CEUs with Yoga Alliance. Note: Please bring your own props (a bolster, 2 yoga straps, 2 blocks, 6 blankets) and eye pillow, if you have them. Some props are provided in the Centre to borrow.